There is only one place to practice ocean freediving around Brisbane and that is north and west parts of Moreton Island. Freediving Gold Coast believes that these areas are as good for freediving as anywhere else in the word – in the right conditions. Once every six months Freediving Gold Coast offer a 3 day Ocean Freediver course based on Moreton Island exploring the beautiful waters around the Tangalooma Wrecks. This is 3 days of living and breathing freediving. 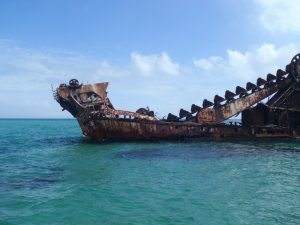 The Tangalooma Wrecks were sunk in 1963 because of the need for a safe anchorage for boats on the Western side of the island. In total 17 wrecks were sunk. 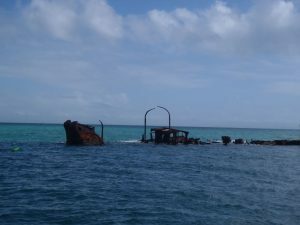 The unintended effect of the sinking of these wrecks has been to provide a haven for fish, snorkelling and scuba diving activities. But why snorkel the Tangalooma Wrecks when you can learn to freedive them. 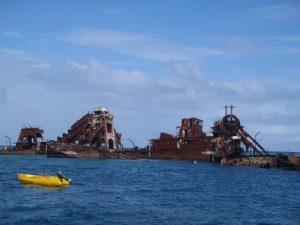 Our next course and camp at the Tangalooma Wrecks is 6th to 8th April. We depart on the 6th April at 8.30am from the MIcat Moreton Island Ferry Service, 14 Howard Smith Dr Port Of Brisbane QLD. Once arriving at Moreton Island we will walk to the nearby Wrecks Camping Area and set up the three man tents (maximum of 2 people per tent). Over the next three days we will cover a minimum 12 hours of freediving theory and practice for the AIDA 2 Certification of Open Water Freediver. You will also be given free time to dive with your buddy around the wrecks or simply relax and explore the nearby areas. We will depart Moreton Island on Sunday 8th April at 4.30pm by the Micat Ferry. All freediving equipment except wetsuits. We are camping so we are using the eco toilets and cold showers at the campground. This is an adventure exploring one of the most beautiful aquatic and nature places in South East Queensland at an affordable price. Please don’t hesitate to contact us for more information.